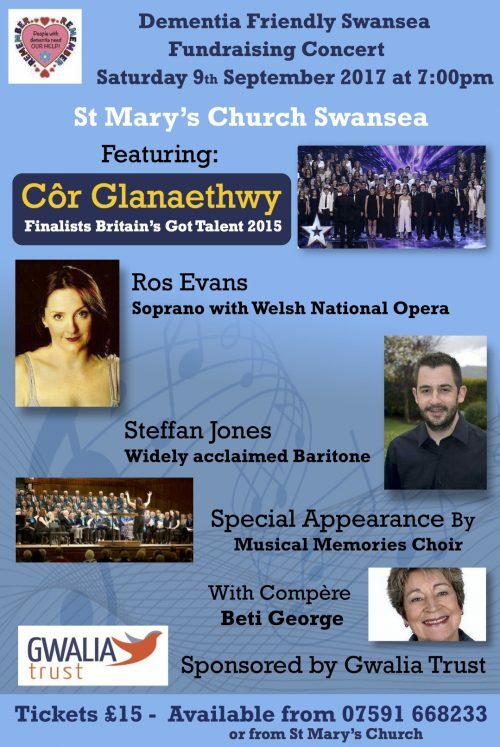 Following on from our highly successful celebration concert held in 2015 to mark Swansea achieving the Alzheimer’s Society recognition process as a ‘Dementia Friendly City’, (the first in Wales to do so), we are proud to present a further special evening of musical entertainment at St. Mary’s Church, Swansea on Saturday 9th September starting at 7pm. 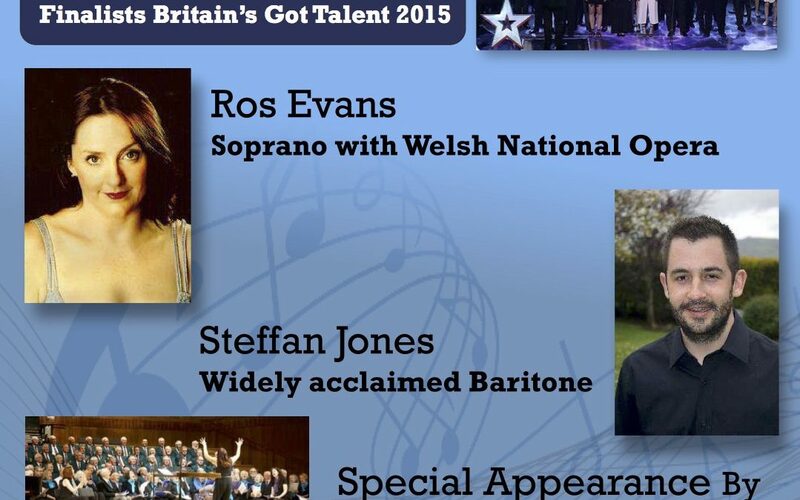 We are thrilled to have secured the services of Côr Glanaethwy, runners up in Britain’s Got Talent 2015, Welsh National Opera Soprano Ros Evans, talented Baritone Soloist Steffan Jones and a special appearance by the Musical Memories Choir. We are especially pleased to welcome the return of our compère for the event Beti George. The income generated from this concert will provide much needed help towards the continued support for those living with dementia in our local community. Since its inception in 2014, Dementia Friendly Swansea has been very active in providing information and coordinating activities for those caring for and living with dementia in the Swansea Bay area. With your support we aim to expand these activities and help make a difference in the lives of those who most need our focus by improving access to sources of information, practical support and activities which improve independence and self esteem. We are deeply indebted to our sponsor Gwalia Trust for their generous support, all the dedicated volunteers and the patronage of our esteemed guests. It will be an incredible feast of music and an opportunity to raise awareness of the needs of those living with dementia. Our membership has grown to over 70 members including solicitors, healthcare professionals/institutions, local authority, small businesses and volunteers. Each year we generate income to continue raising awareness of the effects of dementia on the individual and its impact on families and friends. Our plan this year is to use the funds to extend our programmes in more locations in the area, continuing to increase and enhance those activities that help to support carers, whilst also promoting awareness within the community.